Yes it should have updated your time . 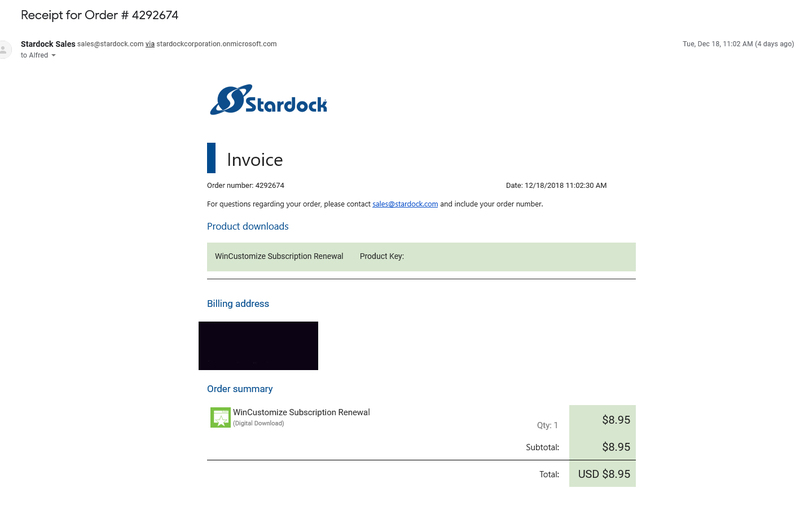 I have forwarded your problem to Stardock Support team for their assistance. Be reminded that Stardock will be on holiday until 2nd January. Please check up the notice posted above for details. Please keep an eye on this thread for any updates. We appreciate your feedback and patience. Mine also says renew at the Stardock Store. I renewed on December 13th. Just checked today and it says expired. I also have a problem with the renewal. I paid but it's still telling me to renew. Thanks AZ, I just want to let them know that there is a problem. I have my Stardock sub coming up I'll wait until this gets cleared up before I re-subscribe to that. I paid but it's still telling me to renew. Mine also says renew at the Stardock Store. I renewed on December 13th. It will always say 'renew' - it does not mean you are expired, just that you can add time to it. If either of your times are wrong, let me know please. Mine still says Expired. Isn't there supposed to be a time indicator where it says Expired? My OD sub tells me Expires in 10 Days. The only way I can tell is I can't see the Subscriber Skins. I fixed your WC sub time but I don't see a recent OD renewal to bump it, you have an order number? I just renewed my OD sub and everything is good. On my downloads page I don't see the WC sub does it disappear when your renewed? I still get ads on WC if I turn off AdBlocker. The WC subscription is different from your OD subscription ALMonty. Renewing the OD subscription does not extend/renew the Wincustomize subscription. The WC subscription order should cause your Wincustomize Subscription to show in your account with about 360 days until it expires at this point. It does for me now. Yea I understand that. My OD sub is fine, the WC sub looked liked what I posted in Reply #7 (first pic) now it's not showing up at all. now it's not showing up at all. You got it Sean... but it says 89 days.